Tucson, AZ / MMI III (Weak shaking): Was in kitchen which has an outside screen door that was not fully shut.It was vibrating so hard that i thought our little dog was outside launching itself at the door to get in, I felt it twice more within a minute or so. Tucson, Az (2536.1 km NW from epicenter) [Map] / MMI IV (Light shaking): Heard windows shaking. Sounded like a strong gust of wind rattling the windows hard. Coronado Villas, Tucson, AZ (2507.8 km NW from epicenter) [Map] / MMI III (Weak shaking): Apartment building trembled. It was shocking because the entire building shook. 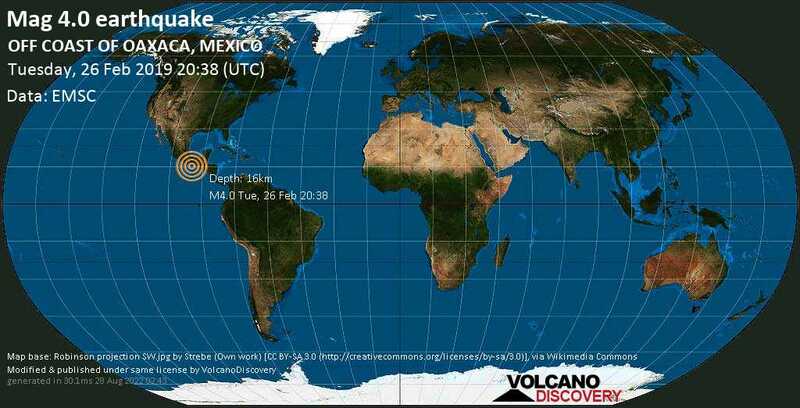 Tucson, AZ (2504.3 km NW from epicenter) [Map] / MMI III (Weak shaking): Felt shaking, then a loud boom and stronger shaking, then another milder shake. Casa Adobes Tucson, AZ / MMI IV (Light shaking): My son was sitting outside, birds at our feeder flew away 1 minute before. Wind where still. He heard a rumble turned around and saw the Windows start to shake. Starting from South to North, 1 window at a time. He could feel the ground shaking. Screened porch attached to the ground was shaking. I was inside and heard a noise then I could hear each window rattle from the front to back. 2nd one was about 2 minutes after the first one. So to me this was a rolling effect moving North. Catalina Foothills Tucson, AZ / MMI IV (Light shaking): Around 1440 today, Feb 26, the front doors and windows rattled for a few minutes. Definitely felt it but not sure if its an earthquake or sonic boom? MARANA, AZ / MMI IV (Light shaking): Rattled my windows for a few seconds. TUCSON, AZ / MMI IV (Light shaking): Definitely felt it although nothing broken, likened to light-moderate shaking, felt it outside, like it was an explosion followed by long vibrations & another explosion, DEFINITELY AN EARTHQUAKE LASTING LESS THAN 5 MINUTES!